A CLYDEBANK school’s exceptional effort in promoting equality has been praised by Scotland’s leading anti-sectarian charity. Pupils at St Eunan’s Primary in Drumry were presented with a special award by Nil By Mouth in recognition of the school’s commitment to building a fairer society. The Gilmour Street school became the first in West Dunbartonshire to receive the charity’s ‘Champions for Change’ award and it’s hoped their success will inspire other schools in the region to follow in St Eunan’s footsteps. Through its anti-sectarianism drive, all P7 children have developed an awareness for the need for change and are committed to spreading a positive message to other schools, friends, family and the wider community. Their ongoing activities involved a link-up with nearby Linnvale Primary which saw pupils and teachers from both schools work together in a common cause. The project involved a literacy topic using the novel Divided City by Theresa Breslin to highlight an issue that has been a problem in the West of Scotland for generations. “St Eunan’s is the first school in West Dunbartonshire to receive our ‘Champions for Change’ award which is sponsored by the Scottish Government to recognise best practice in tackling sectarianism in schools. This award is richly deserved. The pupils and staff at St Eunan’s have impressed us hugely with their commitment and energy. The school have worked closely with Linnvale Primary and local faith leaders, such as Father Boyle and Rev McIntyre, to give pupils a better understanding of the rich variety of religions and cultures in Scotland. The two schools have been developing the inter denominational partnership over the last two years and are eager to build on a flourishing relationship that it is hoped will become stronger as the years progress. P7 pupils Jack McAvoy and Sonia Djabali, both 11, were in no doubt about the value of the project and how it has helped them to understand the wider issues of inequality that exist in Scotland and around the world. Also in attendance was Terry Lanagan, executive director of Education Services at West Dunbartonshire Council, who was also full of praise for the school’s achievement. “I was delighted to learn of the Anti-Sectarianism Accreditation awarded by the charity Nil by Mouth to St Eunan’s Primary School in Clydebank. The award is well deserved recognition for a joint project with Linnvale Primary School aimed at tackling prejudice and sectarianism and celebrating diversity. 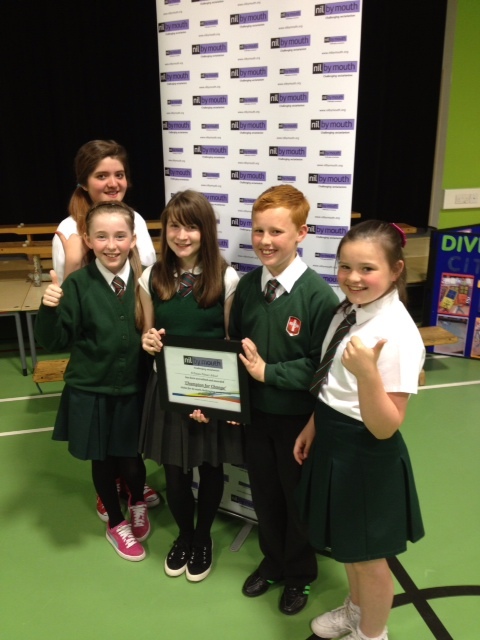 “I was hugely impressed by the articulate manner in which primary 7 pupils talked about the project. In particular, they spoke enthusiastically about the new friendships they had formed with pupils from Linnvale. They also spoke of the importance of diversity and the terrible effects of prejudice. The children are now eagerly anticipating a retreat for the pupils of both schools organised jointly by the two school chaplains.